Terms and Conditions for Zip World locations in North Wales; These Terms and Conditions constitute an agreement between Zip World Limited whose registered office is situate at Zip World Base Camp, Denbigh Street, Llanrwst, Conwy, LL26 0LL (hereinafter called “ZipWorld”) and the Customer (hereinafter called the “Customer”) using the products or services of Zip World. 2. When might we have to postpone or amend your booking? 12. What's included in the price? “Adventure” – means any of our activities which we offer on any of our Sites from time to time. “Participant” – means a person who is booked to participate in any of our Adventures by virtue of a Booking. “Booking” – means a booking made by you for any of our Adventures. “Designated Location” – means the location of the start of the relevant Adventure. “Participating Adult” – means an adult who accompanies any child or children and actively participates in an Adventure. For the avoidance of doubt, a Supervising Adult can also be a Participating Adult. “Participation Form” – means the Acknowledgement of Risk and Conditions of Participation Form which must be signed by all Participants before taking part in an Adventure. “Promotional Offers” means any special offers we may advertise or offer from time to time in connection with any of our Adventures. “Site” – means the site on which an Adventure takes place and “Sites” shall mean all or (where the context requires) any of them. “Supervising Adult” – means an adult or adults who accompany any child or children to any of our Sites. “Terms” – means these terms and conditions as amended by us from time to time. “Website” – means our website www.zipworld.co.uk. These Terms apply to any Booking. These Terms constitute an agreement between Zip World Limited (company registration number 07777872) whose registered office is situated at Zip World Base Camp, Dolanog, Denbigh Street, Llanrwst, LL26 0LL (“Zip World/us/we”) and the person or firm who is making the Booking or participating in the Adventure/s (the “Customer/you”) and will apply to any Booking you make (Agreement). Our Terms include important information about our Adventures including any restrictions on who can or cannot take part in them. Give them a good read! If you or any Participant suffers from any pre-existing medical condition, we recommend that you contact us before booking to ensure it does not preclude you from participating in any of our Adventures. Failure to do so may mean you or the relevant Participant cannot take part and no refund would be payable by us. You acknowledge that you have read all these Terms (including the important bits) and you agree to make sure all Participants are aware of and have accepted these Terms. Please note, by booking or participating in any of our Adventures you accept and agree to be bound by these Terms. (ii) acknowledge in entering into this Agreement you do not rely on any statement, representation, assurance or warranty (whether made innocently or negligently) that is not set out in these Terms. Can you participate in our Adventures? Please check details on our restrictions and medical restrictions before completing your booking. (iii) subject to availability (and in accordance with these Terms), change the Booking to another of our Adventures up to the same value of your original Booking. (iv) make sure you request it within 14 days of the date of the cancelled Adventure! c. If you don’t claim a refund within 14 days, you must re-schedule your Booking within a period of 12 months in accordance with Condition 3(a)(ii) above otherwise you will forfeit your Booking. d. If we have to permanently cancel your Booking and we cannot offer you an alternative there will be no penalty or administration charge and a refund in full (if applicable) will be made within ten (10) working days of us notifying you of the cancellation. No other compensation consequential losses or any other losses will be payable to you. e. Refunds for peak and off peak pricing if we postpone; If we postpone a non peak time slot the customer can re-schedule onto a peak session without additional charge. If we postpone a peak session time slot and the customer re-schedule to an off peak session they will be entitled to a refund of the difference in price between peak and off peak or can transfer that amount towards booking another adventure. Every Participant is required to sign a Participation Form. If an Participant doesn’t sign a Participation Form, or doesn’t comply with any of the terms set out in the Participation Form, it may result in that Participant being prohibited from taking part in the Adventure concerned. If this happens, no refund will be paid and we will not be liable for any compensation, consequential losses or any other losses arising. You are able to request from us a copy of this form in advance of attending the adventure by contacting our team on +44 (0)1248 601444. We recommend you make advance reservations to avoid any disappointment. You can make these reservations through our Website, directly with us via our telephone booking line (+44 (0)1248 601444) or through an approved Zip World booking representative (such as Tourist Offices, Hotels and other such outlets). a. If you book directly with us online, then we will ask for your credit or debit card details to complete the purchase and a “booking confirmation email” will be created and sent to you. Full payment will be debited and your account statement will identify the transaction as “www.zip-world.co.uk”. Don’t worry though, this payment gateway is provided by PayPoint which is a SSL secure gateway. b. If the Booking is made directly with us by any means other than online, credit or debit card details will be requested to complete and / or guarantee the reservation. Telephone bookings will incur a £3.50 administration fee. This will be confirmed when the booking is made. Payment will be debited accordingly and your account statement will identify the transaction as “Zip World Limited”. c. If the Booking is made through an approved Zip World representative, payment will be taken in accordance with their own terms and conditions of ticket sales. The reservation is guaranteed by the issuing of a payment receipt – so make sure they let you have one. d. Where payment has not been completed we may (at our discretion) provisionally reserve the place but reserve the right to re-allocate it if another Customer requests and secures the booking by payment. If this happens, we will notify you and give you the opportunity to complete the payment immediately. e. If you are a consumer, you can only book one of our Adventures if you are at least 18 years old. f. If you are not a consumer, you confirm you have authority to bind any business on whose behalf you are making a booking. g. We do not store any payment processing details, however our payment partners may retain your details in line with their terms and conditions for the purposes of providing refunds and answering payment related queries. For further details of how payment details are processed, please contact our team either by phone on +44 (0)1248 601444 or via email at info@zipworld.co.uk and we will be able to direct you to the relevant processing partner. Full payment must be made before you start your Adventure. Vouchers bought directly from us are valid until the date printed on them. They cannot be redeemed after that date, unless an extension is purchased from us. In order to provide vouchers, it is necessary that we ask you for personal details of the person placing the order as well as any individual who will be redeeming the voucher. This is to allow us to generate and send vouchers. The data captured for this purpose may include but is not limited to Name, Address and Contact Details. This data will never be used for any reason other than processing your voucher order and will never be shared with a third party without your knowledge. Extensions are valid for 3 months from the expiry date and cost £10 per voucher, for 3-6 months from the expiry date and cost £15 per voucher and for 6-12 months from the expiry date and cost £20 per voucher. Vouchers bought via a booking agent will be governed by the agent’s terms and conditions. If an intended purchase is for a higher amount than the face value of the voucher(s), the difference can be made up with a card payment. If it is less, then change cannot be given. Vouchers cannot be used in conjunction with any special promotions, discount tokens, coupons or cards. If one or more products in a package are cancelled by you at any time, the remaining Adventures will be charged at the single Adventure price. If one or more of the Adventures are postponed by Zip World, the refund option of that Adventure will proportionate to the discounted package price. If one or more Adventures are postponed by Zip World, you will have an option to be refunded for this adventure or to postpone it to another date. Other Adventures within the package may be postponed but cannot be refunded. Where possible a booking amendment will be accommodated without charge or penalty. a. Individual bookings may be cancelled or amended up to 7 days prior to the adventure. You will be entitled to a full refund in the event of cancellation under this Condition 10(a). b. Group bookings of 6-15 Participants may be cancelled or amended after the giving of at least 14 days’ notice of cancellation or reduction of numbers. c. Group bookings of 16 or more Participants may be cancelled or amended after the giving of at least 28 days’ notice of cancellation or reduction in numbers. d. Deposits paid for group bookings are non-refundable except in the circumstances outlined in Condition 26.
e. In Conditions 10(a), (b) and (c) above the time limits referred to relate to the original Adventure booking date. Once an Adventure date has been amended or cancelled then you cannot further amend or cancel the adventure date and the provisions relating to refund or further amendment will not be available you. f. Discounts or booking tariffs may vary but are based on minimum group sizes. In the event that minimum group size is not achieved then the relevant pricing tariffs will apply. g. Refunds for peak and off peak pricing if the customer postpones; If the customer postpones and wants to reschedule to a peak session they will need to pay the additional charge to upgrade. If the customer postpones and re-schedule to an off peak session they will not be refunded the difference between peak and off peak. h. Our Caverns and Zip Safari adventures include an intensive training session, if you cannot continue on to the main course then a refund of 50% of the price paid will be given. a. If you are a consumer, you have a legal right to cancel an Agreement during the period set out below in condition 11(b). This means that during the relevant period if you change your mind or decide for any other reason that you do not want to receive or keep an Adventure you have purchased, you can notify us of your decision to cancel the Agreement and receive a refund. Advice about your legal right to cancel the Agreement is available from your local Citizens' Advice Bureau or Trading Standards office. Your Agreement is for a single Adventure. The end date is the end of 14 days after the day on which you receive our e-mail confirming your order for an Adventure. c. To cancel an Agreement, you just need to let us know that you have decided to cancel. 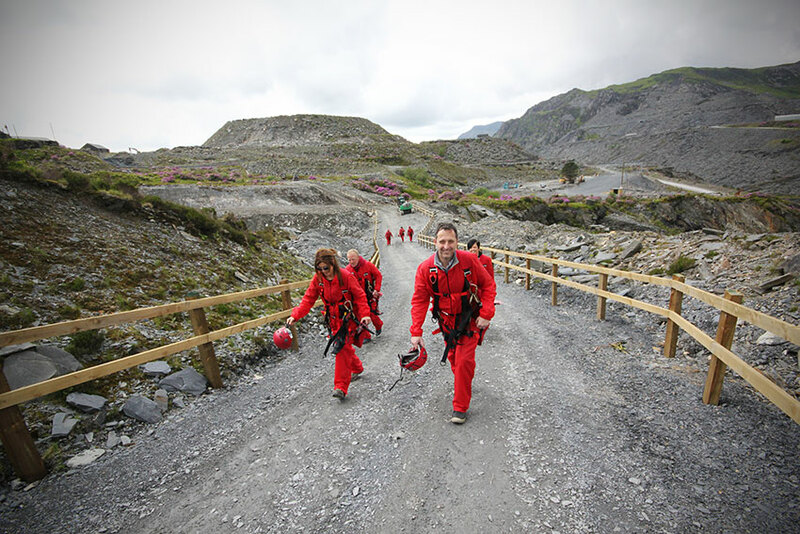 The easiest way to do this is to send us an email to info@zipworld.co.uk. d. If you cancel your Agreement we will refund you any monies you paid for the Adventures which have been cancelled in accordance with this clause 11. Prices quoted will be current at the time of your Booking, Zip World operates a dynamic pricing model and prices are subject to change at our absolute discression. The price agreed will not be subject to any change unless due to circumstances beyond our control. Such circumstances include (but are not limited to and by way of example only) civil riot, new legislation, regional or national emergency, war etc. Where such a price amendment is necessary you will be notified in writing. Should a price amendment be unacceptable to you the booking can be cancelled in accordance with Condition 10 above. 12. What’s included in the price? The price will include the Adventure, all necessary equipment, public liability assurance and VAT. The price doesn’t include personal insurance, snacks, lunch, beverages, optional adventures and excursions, gratuities and any other items not specifically mentioned as being included. As a general rule, bookings will be accepted on the basis of information supplied by you at the time of booking. However, at our discretion, proof of any concession entitlement may be requested at any time during fulfilment of the Adventure booked. Failure to produce required evidence upon request may result in the concession / discount being withdrawn and payment being requested amounting to a difference between that which has already been paid and the full published price. a. In the interests of others we operate a strict timekeeping policy. b. All Participants in your party must arrive at the relevant designated location at least thirty (30) minutes prior to the Adventure commencement time. We will endeavor to get you back to the adventure finishing point within fifteen (15) minutes of the scheduled finish time but cannot guarantee this due to Adventure delays or other circumstances beyond our control. c. Failing to arrive at or before the scheduled time will not entitle you to a refund. There will be no compensation paid for consequential losses, lost or additional travelling expenses or other expenses of a similar nature. a. Our Sites may have automated camera systems installed. During your visit your image may be captured by one or more of these devices. By visiting our Sites you accept that you may be filmed either for the production of stills or video. These images may be used within products such as commemorative photographs purchasable onsite. Footage may also be used for promotional purposes. b. Video reprography is a service that may be offered by one of our partners; Ustar or Thirll Pix. Neither Ustar, Thrill Pix nor Zip World accept any liability if this service cannot be provided for whatever reason. In such circumstances no refund will be given nor compensation paid. Data provided at experience check-in, including your e-mail and mobile phone number, will be shared with Ustar or Thrill Pix for the purpose of providing you with the video reprography option if required. c. Still reprography is a service offered by one of our partners UStar or Thrill Pix Media. Neither UStar or Thrill Pix Media nor Zip World accept any liability if this service cannot be provided for whatever reason. In such circumstances no refund will be given nor compensation paid. d. Some of our Sites have Garmin VIRB headcams for hire. These can only be hired by Participants over the age of 18. If you do hire one you are at all times responsible for the operation of the camera during the hire period. We are not responsible for improper use of a camera by an Participant which results in the recording of the adventure failing or being of a standard below that to which you require. Similarly, Zip World will not be liable for any recording made onto SD cards which are provided in the hire. e. In the case of children under the age of 18, you accept and consent by making the Booking that still or video images of children will be taken during the reprography process. f. Many of our visitors will also be capturing video and photographs whilst on site whether by the use of our Garmin VIRB headcams or personal devices, by attending our site, you understand and accept that we are not responsible for the use of any images of you that may be captured in this way. a. Full legal responsibility for any child or children in your group lies with the Supervising Adult. The Supervising Adult must sign the Form on behalf of the child/children. Children under the age of 18 years will not be permitted to use any Adventure unless accompanied by a Participating or Supervising Adult at all times. Please see below restrictions for each Adventure. Children must be accompanied by 1 Participating Adult for every 3 children taking part in Velocity 2, the Penrhyn Quarry Tour and Titan. Minimum age for a child on Velocity 2 is 10 years, 5 years for the Penrhyn Quarry Tour and 7 yeras for Titan. Children aged between 10 and 12 years must be accompanied by 1 Participating Adult for every 3 children. Children aged between 13 and 17 years must be accompanied by 1 Participating Adult for every 7 children. Minimum reach requirement of 1.8m with feet flat on the floor. Children aged between 7 and 12 years must be accompanied by 1 Participating Adult for every 7 children. Children aged between 13 and 17 years must be accompanied by 1 Supervising Adult for every 7 children. Minimum age permitted underground is 3 years. Prams/buggies are not permitted underground. * Supervision of children 7 - 17 yrs from the Treetop Nets area is not charged for. All first time Participants and Supervising Adults will be asked to attend a short safety brief. Children aged between 9 and 12 years must be accompanied by 1 Participating Adult for every 3 children. Children aged between 13 and 15 years must be accompanied by 1 Participating Adult for every 7 children. Children aged 16 and 17 years must be accompanied by 1 Supervising Adult in a ration of 1 adult to 4 children. Children aged between 7 and 8 years must be accompanied by 1 Supervising Adult. Children aged 5 and 6 years must be accompanied by 1 Participating Adult for every 3 children. Children must be accompanied by at least 1 Supervising Adult. Children 7-17 years must be accompanied by 1 Participating Adult. * Supervision of children 7 - 17 yrs from the Coaster Station Area is not charged for. a. Unfortunately we are currently unable to offer special or modified Adventures to accommodate disabled Customers requiring a wheelchair or other such mobility assistance and / or special access across all of our Adventures and Sites. More information on how Zip World aims to accommodate those with accessibility requirements can be found at https://www.zipworld.co.uk/medical-restrictions. Please check this detail before completing your booking or contact us on 01248 601 444 to discuss your requirements. b. We reserve the right to decline participation in any Adventure on any of our Sites on the basis of a pre-existing medical condition which must be disclosed to us in the Participation Form or (if earlier) at the time of the Booking. Pet animals are permitted on our Sites with the exception of any of our Sites which are located underground. However pet animals must at all times remain under the control of the owner or person accompanying them. If any of our operatives or employees in their absolute discretion direct that pet animals must be removed from the any of our Sites then you must comply with this request which may be made on the basis of lack of control, animal welfare or hygiene. The consumption and use of alcohol and non-prescribed drugs is strictly prohibited on all our Sites at all times. We reserve the right to refuse admission to any person who is considered to be under the influence of alcohol or non-prescribed drugs. Smoking is not permitted at any time when our equipment is being used. Zip World has appropriate public and employer liability insurance. Personal insurance against injury, theft, loss or any other event is not included and you must arrange for such cover, if required, to be in place. This condition 23 only applies if you are a consumer. a. If we fail to comply with these Terms, we are responsible for loss or damage you suffer that is a foreseeable result of our breach of these Terms or our negligence. Loss or damage is foreseeable if it is an obvious consequence of our breach or if it was contemplated by you and us at the time we entered into an Agreement. This condition 24 only applies if you are a business customer. (iv) any indirect or consequential loss. c. Subject to condition 24(b), our total liability to you in respect of all losses arising under or in connection with an Agreement, whether in contract, tort (including negligence), breach of statutory duty, or otherwise, shall in no circumstances exceed the price of the Adventures purchased. d. Except as expressly stated in these Terms, we do not give any representation, warranties or undertakings in relation to the Adventures. Any representation, condition or warranty which might be implied or incorporated into these Terms by statute, common law or otherwise is excluded to the fullest extent permitted by law. In particular, we will not be responsible for ensuring that the Adventures are suitable for your purposes. a. Zip World is not responsible for and accepts no liability for any loss or damage caused to any vehicle belonging to you or any member of your party or to the contents therein when the vehicle is parked on any of our Sites. b. If you or any Participant deposits personal possessions, items of clothing or any other property with an employee or a third party on any of our Sites then they do so at their own risk and Zip World will not be responsible for any loss or damage to these items however caused. In the event of cancellation or postponement of an Adventure by Zip World the provisions relating to cancellation and amendment which are available to the Customer under the provisions of Condition 7 ante will not apply to cancellation or amendment by Zip World in the circumstances envisaged by this Condition. Zip World reserves the right to re-allocate an unsecured Booking at any time. We reserve the right to make alterations or changes to these Terms at any time ensuring that the Customers of existing bookings will receive the latest copy of the Terms prior to participating in an Adventure. Should the revised Terms be unacceptable to a Customer who has pre-booked the booking may be cancelled without penalty or administration charge. a. We will not be liable or responsible for any failure to perform, or delay in performance of, any of our obligations under an Agreement that is caused by an Event Outside Our Control. An Event Outside Our Control is defined below in Condition 27(b). b. An Event Outside Our Control means any act or event beyond our reasonable control, including without limitation strikes, lock-outs or other industrial action by third parties, civil commotion, riot, invasion, terrorist attack or threat of terrorist attack, war (whether declared or not) or threat or preparation for war, fire, explosion, storm, flood, earthquake, subsidence, epidemic or other natural disaster, or failure of public or private telecommunications networks or impossibility of the use of railways, shipping, aircraft, motor transport or other means of public or private transport. (ii) our obligations under an Agreement will be suspended and the time for performance of our obligations will be extended for the duration of the Event Outside Our Control. Any disputes or complaints must be brought to the attention of Zip World in writing within fourteen (14) days from the occurrence which gave rise to the complaint / dispute. On receipt Zip World will respond within 14 days in writing. Zip World will endeavor to investigate and resolve such a dispute or complaint without involving third parties. In the event of a complaint or dispute not being satisfactorily resolved both Zip World and the Customer hereby agree that the dispute will be settled and determined by arbitration pursuant to the laws of England and Wales under the provision of the Arbitration Act of 1996.
a. We may transfer our rights and obligations under an Agreement to another organisation, but this will not affect your rights or our obligations under these Terms. b. This Agreement is between you and us. No other person shall have any rights to enforce any of its terms, whether under the Contracts (Rights of Third Parties) Act 1999 or otherwise. c. Each of the Conditions of these Terms operates separately. If any court or relevant authority decides that any of them are unlawful or unenforceable, the remaining Conditions will remain in full force and effect. d. If we fail to insist that you perform any of your obligations under these Terms, or if we do not enforce our rights against you, or if we delay in doing so, that will not mean that we have waived our rights against you and will not mean that you do not have to comply with those obligations. If we do waive a default by you, we will only do so in writing, and that will not mean that we will automatically waive any later default by you. e. If you are a consumer, please note that these Terms are governed by the law of England and Wales. This means an Agreement for a purchase of through our site and any dispute or claim arising out of or in connection with it will be governed in accordance with the law of England and Wales. You and we both agree that the courts of England and Wales will have non-exclusive jurisdiction. However, if you are a resident of Northern Ireland you may also bring proceedings in Northern Ireland, and if you are a resident of Scotland, you may also bring proceedings in Scotland. f. If you are a business, an Agreement and any dispute or claim arising out of or in connection with it or its subject matter or formation (including non-contractual disputes or claims) shall be governed by and construed in accordance with the law of England and Wales. g. If you are a business, we both irrevocably agree that the courts of England and Wales shall have exclusive jurisdiction to settle any dispute or claim arising out of or in connection with an Agreement or its subject matter or formation (including non-contractual disputes or claims). All Promotional Offers are subject to availability. Promotional Offers are non-transferable, not for resale, and not redeemable for cash. Promotional Offers only apply to the specified product or products. Promotional Offers cannot be used in conjunction with another offer. Promotional Offers are valid until the date specified. Zip World reserves the right to withdraw a Promotional Offer at any time. Only one booking for one date can be made at any given time, once you have participated in that adventure you will then be able to book your next adventure. Winter memberships can only be used by the named individual / family names on the membership. Winter membership bookings and participation on adventures can only be made once your membership card is received through the post within 7 days of purchase or once 7 days have passed since the purchase of your membership (Membership cards may take up to 14 days to arrive). Memberships are not transferable between individuals. Photo ID of any adult members will be requested upon entry. Only named members on your membership card are able to participate. The winter membership operates from 6th November 2018 through to 31st March 2019. Winter membership is not valid on any adventure between February 16th 2019 and March 3rd 2019. Family membership may be made up of 4 family members, up to a maximum of 2 adults over the age of 18. No refunds will be made available for any unused memberships at the end of the period. Your membership will permit entry to your chosen location and allow for you to partake on all of the named adventures. It is recommended that you pre-book your adventure prior to arrival by calling the adventure booking centre on 01248 601 444. Should you arrive at a location without pre booking participation will be dependent on availability. Bookings are limited to one go on each adventure per day of visit, subject to availability. Some of our adventures are weather dependant and no refunds are available for adventures having to be postponed due to weather. For any additional family or friends not named on your membership card wanting to attend with you on the day of a visit will be eligible for a 20% discount on additional tickets. Our standard terms and conditions are applicable for all adventures booked during your membership period. Artists, vendors and attractions listed are subject to change. The start and end times listed are subject to change. Please check our website for the latest information prior to the festival date. By attending the festival, you give your express consent to any media (images / video) taken during the festival to be used in any media for any purpose at any time, for no fee. Tickets purchased are non-refundable except in the circumstance of event cancellation and are always non-transferable. Any unused tickets will not be refunded. Under 18s are not allowed on site unless accompanied by a ticket holder aged over 18. Only food and beverages purchased on site can be consumed at the event. Zip World own the right to make amendments or cancel the event if required at any point, for example in the case of adverse weather. Any medical issues or disabilities that can affect your access to our event must be disclosed prior to purchasing a ticket. In the event of a cancellation Zip World do not accept any liability to pay any compensation or damages. Strictly no illegal substances will be permitted into the event. Security staff will be present and bags will be checked on arrival and subsequently if deemed necessary. By purchasing a ticket you agree to allow these searches to take place. No unauthorised camping is allowed. Information on camping options will be released nearer the festival date. When purchasing alcohol on site proof of ID may be required if the ticket holder looks under 25. We will only accept a valid passport or driver’s licence. No dangerous items including and not limited to knives, weapons, fire items etc can be brought into the event. These items will be confiscated. Bags will be searched upon entry to the event and subsequently on request of security staff. Zip World reserves the right to refuse entry or remove any persons from the event. In this case such persons will not be entitled to a refund. Your booking confirmation email is your proof of purchase and this is what will be required at entry. Zip World reserves the right to perform any security searches of persons and items where deemed necessary. Zip World standard terms and conditions in relation to our liability apply to this event. i. The loyalty card must be presented at the time of purchase. ii. Loyalty card stamps can be collected on food and drink purchased in Fforest Caffi, Fforest Coffi and Blondins Restaurant. iii. Stamps cannot be exchanged for cash or any other Zip World products. iv. We reserve the right to exclude certain product lines from the loyalty card scheme. v. No minimum spend per transaction. vi. Each transaction will be rewarded with one loyalty card stamp. vii. Once the loyalty card holder has redeemed 6 individual stamps the card holder will be entitled to a free hot or cold drink of their choice. viii. The loyalty card remains the property of Zip World Ltd.
ix. Zip World Ltd reserves the right to amend or withdraw the card and scheme without any notification. x. Zip World ltd cannot be held responsible for lost or stolen cards. xi. To redeem your 20% discount off Winter menus at Fforest Caffi or Blondins restaurant please show your loyalty card at time of order and payment. xii. 20% off winter menu discount includes food and drinks purchased. xiii. 20% off winter menu discount expires on 31/3/19. xiv. 20% discount cannot be redeemed in conjunction with any other offers or discounts. - This promotion entitles anyone booking a single qualifying Zip World adventure to take place on a Monday between 14th January 2019 and 25th March 2019 (excluding Monday 18th February and Monday 25th February 2019), to receive an additional ticket of the exact same type, for the same time slot. - The promotion only applies to purchases made after 17:00 on 11/01/2019. - The promotion only entitles you to an additional ticket of the same type, rather than an additional participant in shared adventures. For example, if you purchase an adult and child combined ticket for the Fforest Coaster, you will receive an additional adult and child combined ticket for the same time slot, allowing another adult and child to take part in the adventure with you. - If booking an adventure by phone or in person on site, please inform staff that you wish to take advantage of the two for one offer. - This promotion does not apply to the Velocity 2 or the Penrhyn Quarry Tour adventures. All other adventures are subject to availability; we cannot guarantee that every adventure will be operating on Mondays during the promotional period. - If only one person takes part, the other ticket will still be marked as used. Both participants have to take part on the same day and in the same time session. - If a booking is postponed by Zip World, you will be entitled to re-book onto another Monday within the promotional period. - All Zip World adventures have their own specific terms, conditions and restrictions. Please check these beforehand to ensure the adventure you are purchasing is suitable. - Standard Zip World Terms and Conditions apply. a. Cotswold Outdoor are delighted to offer a 15% discount, both in-store and online. To redeem your discount, either present a valid discount flyer or your Zip World booking confirmation in-store or quote valid discount code online. T&Cs apply. Selected lines are exempt. Not to be used in conjunction with any other offer or discount. Only valid on production of a valid discount flyer or your Zip World booking confirmation in-store or use of code online. Offer expires 31.12.19.
b. Snow+Rock are delighted to offer a 15% discount, both in-store and online. To redeem your discount, either present a valid discount flyer or your Zip World booking confirmation in-store or quote valid discount code online. c. Runners Need are delighted to offer 15% discount, both in-store and online. To redeem your discount either present a valid discount flyer or your Zip World booking confirmation in-store or quote valid discount code online. d. Cycle Surgery are delighted to offer 15% discount, both in store and online. To redeem your discount either present a valid discount flyer or your Zip World booking confirmation in-store or quote valid discount code online. T&Cs apply. Selected lines are exempt. Not to be used in conjunction with any other offer or discount. Maximum 10% discount on bikes. Only valid on production of a valid discount flyer or your Zip World booking confirmation in-store or use of code online. Offer expires 31.12.19. All Zip World adventures have their own specific terms, conditions and restrictions. Please check these before ordering to ensure the adventure you are purchasing is suitable. We reserve the right to change the menu and its pricing without notice. In order to provide our adventures, we collect data about individuals, usually within a business context. We treat all data which identifies an individual or when combined with any other information can identify an individual as personal data. Unless otherwise stated at the time of collection, we will be defined as the ‘Controller’ of the personal data you provide to us. This means that we control what happens to and what is done with this data that is in our possession. Details of incidents involving minors may need to be retained for up to three years following their 18th birthday. Details of incidents involving adults will be retained for no longer than 5 years following the incident. We will endeavor to provide details of any processing including any third parties that may have access to your data and the location of the processing whenever we ask you to provide information. Personal data that we process directly is typically managed through our relationship management system which is located in the UK and all data may be accessible to our system support partner, Fusemetrix. In addition, we use third party software to help manage our records and stay in touch. Details of this software will be given where appropriate when we collect information from you. Should you have any questions about how we handle your data or wish to update any information that we hold about you, please get in touch with us either by phone on 01248 601 444 or via email at info@zipworld.co.uk. ALL RIGHTS RESERVED Notice: No part of this publication may be reproduced or transmitted in any form or by any means, electronic or mechanical, including photocopying and recording, or stored in a database or retrieval system for any purpose without the express written permission of Zip World Limited. Zip World Limited reserves the right to make changes to this document at any time without notice and assumes no responsibility for its use. Zip World Limited products and services can only be ordered under the terms and conditions of Zip World Limited’s applicable agreements. All of the features described in this document may not be currently available. Refer to the most recent product announcement or contact Zip World Limited sales team for information on feature and product availability. This document contains the most current information available at the time of publication. When new and/or revised information becomes available, this entire document will be updated and distributed to all registered users.